The TD-4K was great; the TD-4KX is better. That's the predictable long and short of it. But it's not night-and-day, so don't feel too sorry for yourself if you bought the original just a couple of months ago. All the really important stuff - the basic ergonomics and sound - remain the same. But the upgrade is welcome, provided your aim is true on the high toms. Everything - it's slightly better than the already brilliant TD-4K. Possibly too compact for the tallest of players - but that's a very minor gripe. It's almost exactly a year since we had the pleasure of looking at the original incarnation of Roland's TD-4K electronic drum kit. 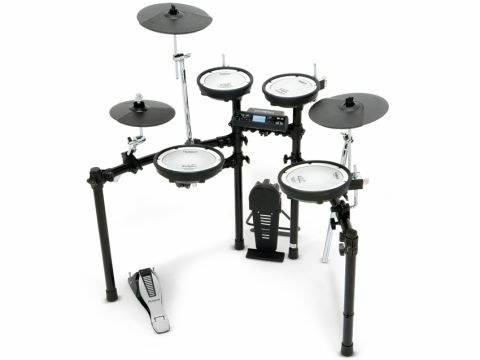 The electronic drum set was introduced as being the best serious entry-level kit that the brand had ever made. And we concurred. There was really little to fault at the price and as such the kit merited a creditable four stars and a definite thumbs-up. "The PDX-6 and PDX-8 toms feel nice, and all-in-all the mesh pads are a no-brainer improvement for Roland to have treated us to"
The TD-4K was a great combination of sensible, playable proportions and compact size. It's not like playing a big old TD-20K, of course, but only the very long of limb will feel cramped by the set-up. The rack is a step on from the TD-3K that preceded it and makes you feel very welcome as soon as you've placed everything where you want it. With the addition of the three mesh pads for the toms, the kit takes on an even more grown-up appeal. We haven't objected to rubber pads on affordable set-ups for ages - by and large they all feel pretty good - but still, there's no escaping the fact that mesh types are still more desirable, both from a feel and quietness-at-home point of view. Roland's new PDX-6 pads are used for the two higher toms, with PDX-8s used for snare and 'floor' tom (the original TD-4K also featured a PDX-8 for the snare, if you recall). It has to be said that the PDX-6s are pretty diddy, with a 6 1/2" playing surface in an 8" rim, but then much bigger than this and they would not fit the TD-4KX kit's compact nature. The diminutive nature of the pads might raise eyebrows - after all, few of us would actually opt for a tom this small on an acoustic kit. But in all honesty for a set-up that has been designed firmly with practice/ home use/project studio use rather than world tours, we're pretty comfortable with the sizing decision. Before we get to the difference the new pads have made, a reminder of the TD-4 module's offerings. The odd little tubular brain might look unassuming-if-funky but sonically it packs quite a punch. Roland have, of course, had plenty of time to get their act together where drum electronics are concerned, and are well past the point where entry level kits sound ace, even if options and functionality are limited compared to the big guns. So it is with the TD-4. It's a very good sounding unit, with some perfectly playable acoustic emulations to choose from, plus the usual suspects in the electro and percussion departments. We wrote in the TD-4K review that it wasn't too long ago that even the high V-Drum kits didn't sound as good, nor respond so naturally, as the TD-4 does. Revisiting it, we're again taken aback by the organic feel of this affordable little box; it's not just a case of nice sounds, but the combined interaction of sensitive pads and tone that makes it a winner. The TD-4 has always been a decent choice for the developing drummer. Its selection of training tools aim to alleviate the boredom of practice sessions and build timing, feel and stamina; Coach Mode gives access to five training exercise options while Quick Record allows the TD-4 to reveal the true extent of your accuracy, or lack of it, with ease. So, do the new mesh pads add to the overall experience? Yes, in our opinion they certainly do, although how much of that is down to a perception that this is now a more 'serious' V-Drum kit we're not sure. Certainly the PDX-6 and PDX-8 toms feel nice and of course they cut down a little on volume for quieter sessions. All in all, they're a no-brainer improvement for Roland to have treated us to.